Wedding cake decoration molds - Chocolate and Fondant molds for wedding cake toppers. Wedding cake silicone molds and chocolate molds for wedding favors. Original, innovative, glamor... This is the wedding by decosil®. A wedding to surprise and to be remembered. A marriage that, to be truly special, requires a wedding cake out of the common, with decorations that go beyond the boundaries of classical and that arrive to avant-garde. 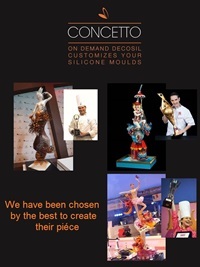 With the molds decosil® you can make figurines of bride and groom for the wedding cake in chocolate or sugar. The molds offered by decosil® all have a common denominator: sophisticated design, non-toxic materials and credible shapes. decosil® silicone molds for food, can be used in pressure casting or with sugar or trasparent or colored isomalt, pre-crystallized chocolate, frosting and classic liquid or other masses of sugar modeling. You can easily create a cake topper for wedding and honeymooners toppers for wedding cakes in chocolate or sugar.